If you're looking for that one kit to wire your entire dollhouse, the CK100 Deluxe Wiring Kit is the answer. 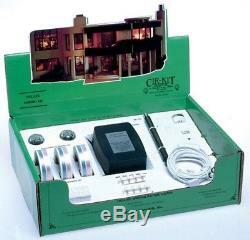 This high-powered kit contains all the basic items included in the Large House Kit, plus a larger 40 watt transformer, and provides a substantial cost savings for those wishing to equip their dollhouse with working outlets and plugs. Its triple quantity of tape will wire a 12 to 15-room dollhouse and the powerful 40-watt transformer will light up to 64 12-volt or 100 16-volt bulbs. The CK204 tester makes easy work of all electrical testing. In addition, eight of our popular plugs and outlets are included in each kit for that final touch of realism. CK100 CONTENTS: 3 CK1001 15' Roll Conductive Tapewire 8 CK1003 Cir-Kit Wall Outlets 8 CK1004 Cir-Kit Plugs 1 CK1007 Junction Splice 1 CK1008-1 Transformer Lead-In Wire (w/switch) 1 CK1009D 12V, 40W Plug-In Transformer (w/built-in circuit breaker) 1 Light Fixture 1 CK1014-1 Pilot Hole Punch (w/needles) 1 CK1015 Instruction Book 2 CK1021-1 1/8 Brass Brads approx. 60 2 CK1023-4 Small Hollow Eyelets approx. 55 Bit 1 CK204 Test Probe. Detailed scale model for adult collectors. Not intended for children under 14. CK0100, dollhouse CK0100, dollhouse Wiring Kit, dollhouse. The item "Dollhouse Miniature Deluxe Wiring Kit #CK0100" is in sale since Thursday, May 17, 2018. This item is in the category "Dolls & Bears\Dollhouse Miniatures\Lamps & Lighting". The seller is "its_totally_minis" and is located in Medina, Ohio. This item can be shipped worldwide. Legal: For adult collectors. Not intended for children under 14. Scale: 1in to 1ft. This is sized for a dollhouse.